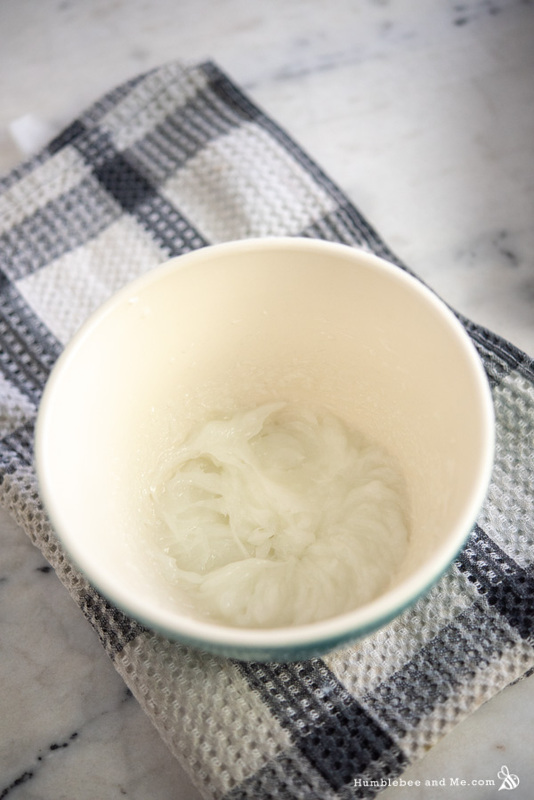 Our base is a blend of solid and liquid surfactants to create a thick, creamy paste that’ll deliver all kinds of creamy lather and cleansing power. To that we’ll add some rich shea butter, stiffening stearic acid, moisturizing vegetable glycerin, and skin-softening safflower oil. This gives us a base that’s highly whippable—soft, but structured enough to hold its own. 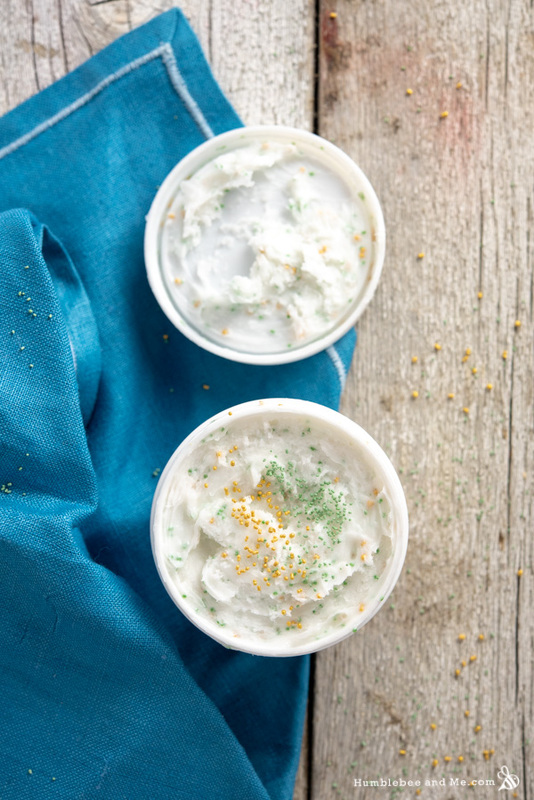 Once we’ve whipped our thick, creamy base into a light, fluffy pouf of goodness, we’ll add some kind of scent. I made this scrub two ways; once with a blend of vanilla-like benzoin resinoid and fir needle essential oil, and once with some Balsam Cedar fragrance oil. Both are lovely, both work beautifully, and it’s totally up to you which one you choose. For exfoliation I’m using a blend of gold and green VitaBurst beads for a rather Christmassy colour scheme. You could use a more natural exfoliant (like ground apricot shells), but I’d recommend choosing something with a holiday type colour scheme if you can. 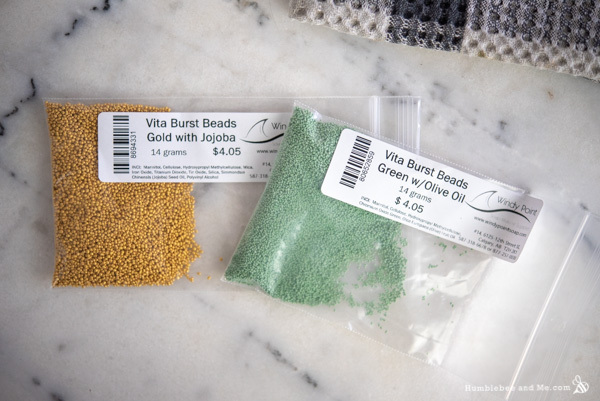 You also also purchase jojoba beads in a variety of colours—red, green, and gold are all great choices, but it’s totally up to you! 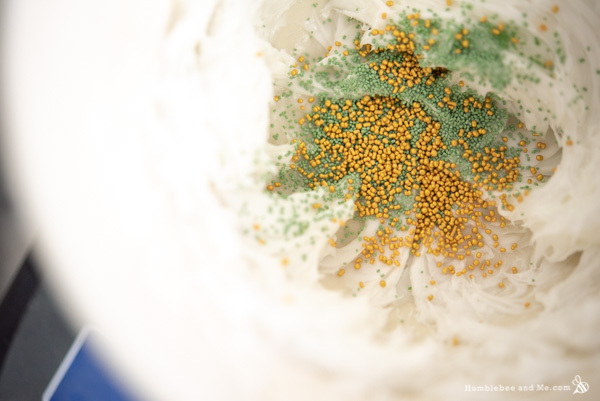 The finished scrub is really fun, and ends up looking quite a lot like frosting with sprinkles mixed in, so maybe it’s best you warn any recipients that it isn’t for eating! I’ve really been enjoying this bit of whippy, bubbly, scrubby fun in the bath—I hope you will, too! 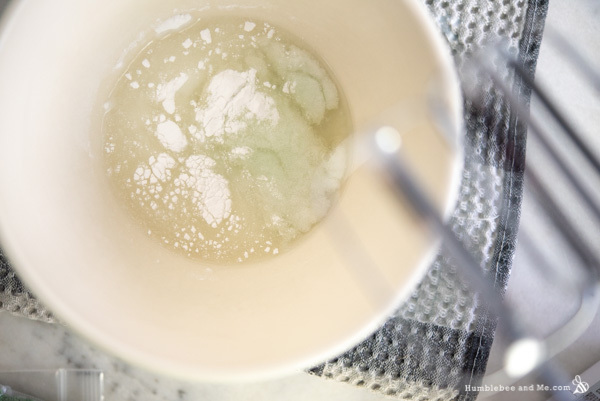 Prepare a water bath by bringing about 3cm/1″ of water to a bare simmer over low to medium-low heat in a medium saucepan. 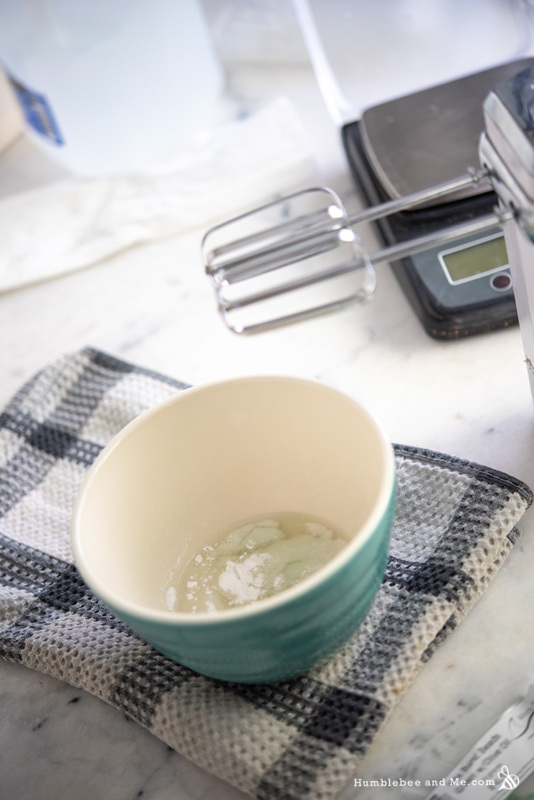 Weigh the primary heated phase ingredients into a medium sized, deep, heat-resistant mixing bowl. 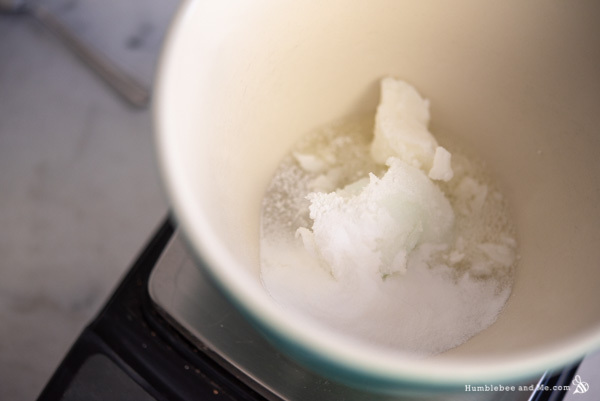 Place the measuring cup in your prepared water bath to melt the SCI into the Cocamidopropyl Betaine. While the primary heated phase melts through, weigh out the secondary heated phase. Once the SCI/Cocamidopropyl Betaine is uniform, add the secondary heated phase and melt all that together. 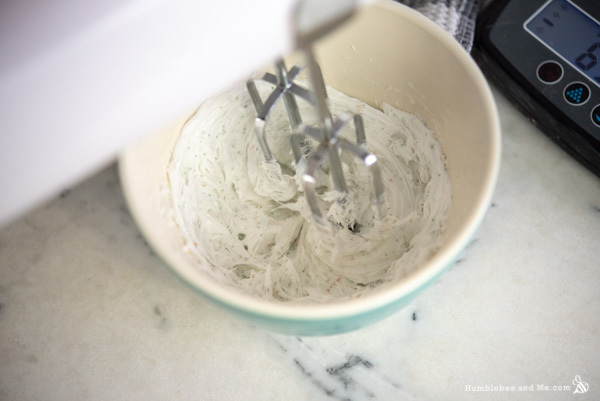 Once the mixture is cool, whip it with electric beaters until it’s light, fluffy, and white—about 3 minutes. Add the essential oils and preservative, and beat again. 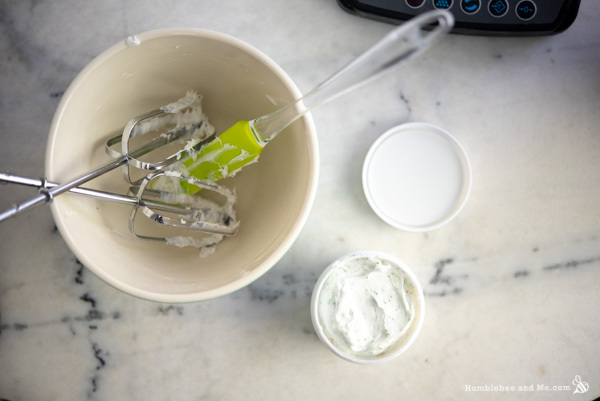 Add your exfoliant, briefly blend, and test to see if it’s scrubby enough for you. Add more exfoliant if you want more scrubby-ness. That’s it! Gently transfer it to a container—a 120mL/4oz jar would be a good size. I used a white 100g jar from YellowBee. Because this scrub contains water, you must include a broad-spectrum preservative to ward off microbial growth. This is non-optional. Even with a preservative this project is likely to eventually spoil as our kitchens are not sterile laboratories, so in the event you notice any change in colour, scent, or texture, chuck it out and make a fresh batch. As I’ve provided this recipe in percentages as well as grams you can easily calculate it to any size using a simple spreadsheet as I’ve explained in this post. As written in grams this recipe will make 100g. I don’t recommend altering the SCI, Cocamidopropyl Betaine, or stearic acid. If you do, you’re on your own—I can’t promise this will whip up well. You can use a different exfoliant if you like—just make sure it’s not water soluble (so no sugar or salt). Something like ground apricot shells, pumice, or jojoba beads would work. 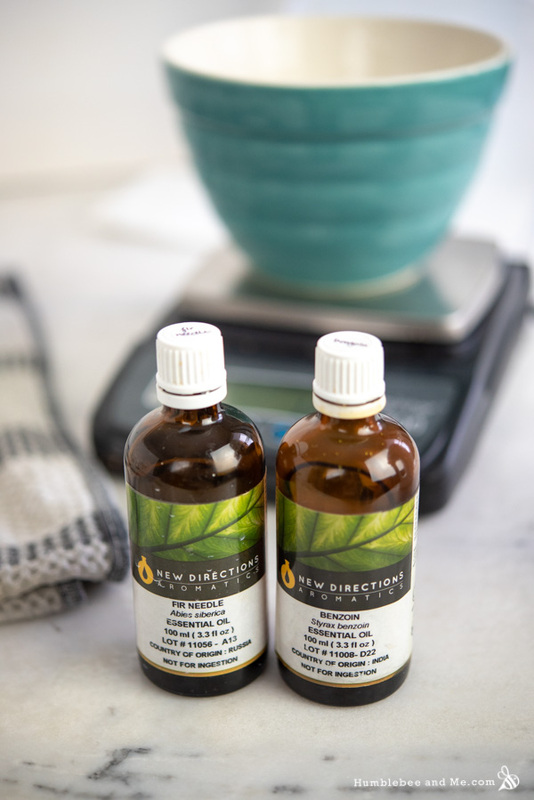 For scent; the recipe as written here uses a 1.5% blend of essential oil/resinoid. I also made a version using 0.5% balsam cedar fragrance oil (USA / Canada). If you want to use the fragrance, add the remaining 1% to the vegetable glycerin. Ooooh! This sounds so nice!! And I have all the ingredients to make it! Score! Wheee, I love it when that happens! Another gorgeous Christmas recipe! And just when I thought I had worked out my Christmas gifts. Sigh! Is there a typo there Marie? Did you mean stiffening stearic acid? Well maybe I should hurry up and make the presents for everyone and then the rest can be presents for me. I look forward in anticipation! Hi Marie, thanks for this lovely recipe! Tried it out today, but the texture of the scrub seems a bit.. rubbery? Not the soft, fluffy texture of yours! I had only SCI noodles on hand ,so i melted that in the Amphosol, also didn’t have SLSa so subbed in more SCI for that. That’s pretty much the only change i made – would this have resulted in the rubbery texture? The scrub also seems to be oozing out a bit of liquid- should I be adding in some polysorbate or ewax? Thanks so much for so kindly sharing your knowledge with us! If that’s the only change you made then yes, I would suspect that’s why yours is different 🙂 It’s hard to know what would be appropriate for the oozing without knowing what the liquid is or why it is oozing out—is the entire mixture too soft, and therefore not holding itself together? If so, you’d want more stabilizing (stearic acid). I doubt it’s short on solubilizing power, but it’s hard to say since you did change things. Hopefully that was somewhat helpful! This sounds delightful. If I left out the scrubby stuff (I just ordered my supplies and forgot to order the jojoba beads ::very sad::) would this make a good foaming bath butter? You think? I haven’t tried it yet so I’m not sure of the consistency. Oh no! The scrubby stuff are what make it fun! Have you tried adding coffee grinds, ground walnuts, or even salt or sugar instead? As for using this as a foaming bath butter, I had to google what that is! In theory, yes! But if you are looking for a bubble bath style product, have you checked out the Five Alive? 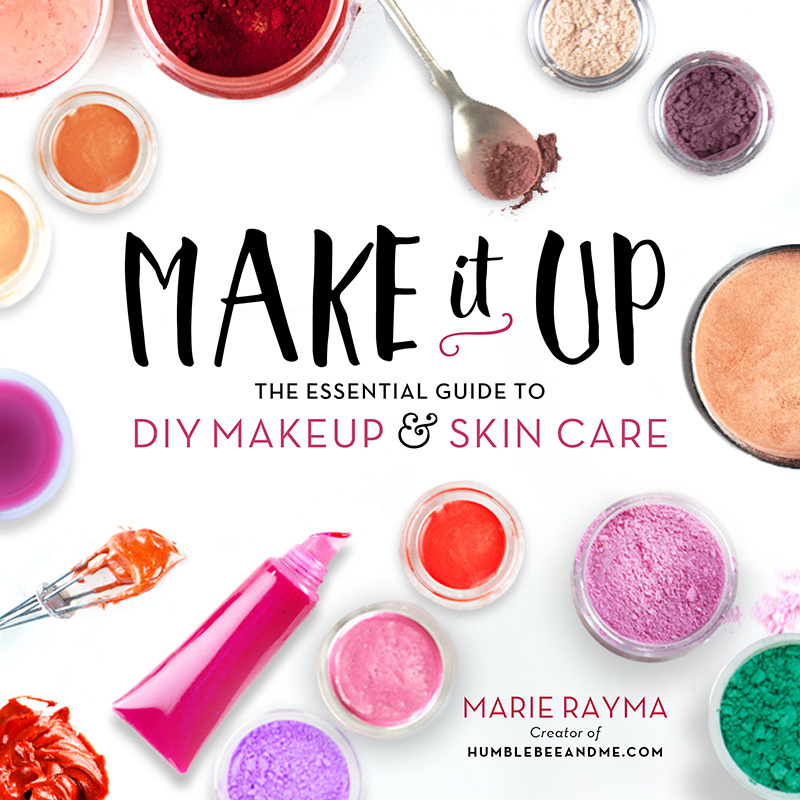 Where do you buy your ingredients and packaging for all your DIY projects?